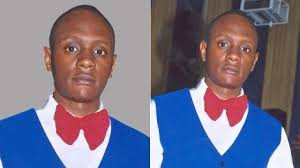 His aunt Qui Wangui Philip wrote on Facebook; “I don’t know much, most will insult but it is serious. If anyone from your group of friends sends an SOS about death being the way out. Please please reach out and try help. My nephew wrote such I didn’t see it. 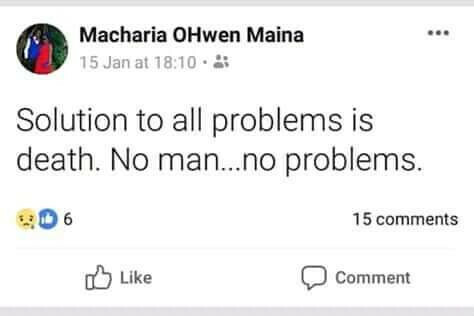 Some of his friends joked about it and he was serious” she wrote. 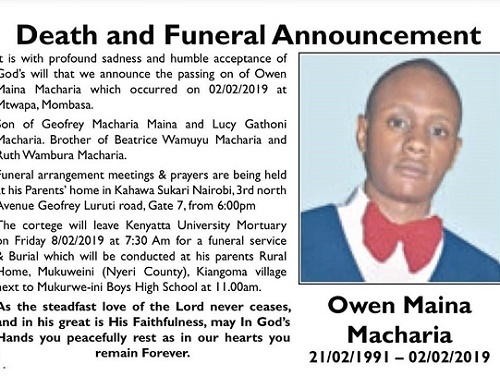 His other kin Jane Wangechi said it pained her to lose a relative “I’ve seen Owen growing, crawl, talk, walk, learn, and grown to a full gentleman, but God knows best”. Owen worked for Invesco Assurance before shifting to Madison Insurance. Friends say he frequented Tribeka Bar and Restaurant in city centre.